How do you raise a toast to the arrival of fall? Naturally, of course. We're not even going to try to play it cool about the fact that fall is finally here. It's time for boots, scarves and pumpkin spice lattes, and we couldn't be more excited. As the air starts to turn crisp, we've uncovered an equally crisp way to savor the season upon us. Based in Flushing, Michigan, the Almar Orchard has been family-run for more than a century, passing its traditions from one generation to the next. Its Orchard Gate Gold hard cider is made from organic apples grown, harvested and pressed on site. 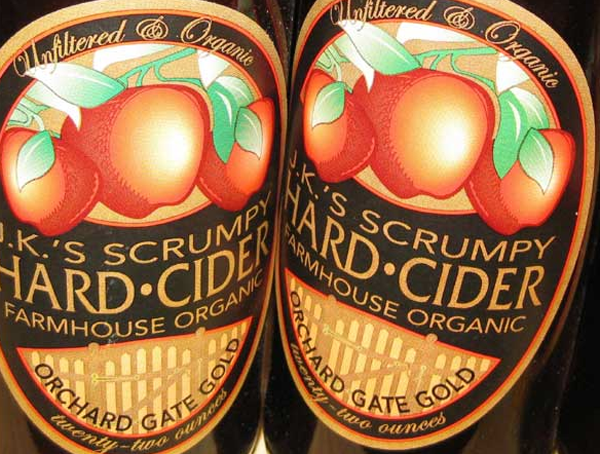 The result: delightfully autumnal bottles of organic "scrumpy," an English-style cider that can be enjoyed hot or cold. As for the philosophy behind the natural, time-tested methods used to create each 22-ounce bottle, proprietor "J.K." explains it best: "In a fast-paced, instant gratification society all this may seem a little old fashioned, or not "cost-effective." But, we have a cider that is not like any other, and the idea of playing around with what makes that happen... well, it just ain't part of the plan." A perfectly seasonal treat honestly crafted straight from the orchard? We'll raise a glass to that. Cheers!